The organisation and running of the Table Tennis Australia 2016 national junior championships have been described as excellent by the event’s referee, Alan Hopkins. He said this was the first time the week-long annual event, usually staged in a state capital or a large regional centre, was held in the outback. Mr Hopkins said all elements, including transport, accommodation and catering were well run, and the sports hall in the Our Lady of the Sacred Heart school complex in Sadadeen had been very suitable. Organiser Graeme Shaughnessy, an Alice Springs resident until April last year, and now living in Adelaide, says more than 300 people had come to town for the nationals, staying in a variety of accommodation houses. This included 169 players in Under 13, 15 and 18 age groups. Mr Shaughnessy says 15 local and four national sponsors, as well as the NT Government, had supported the event which ended yesterday. Most of the equipment bought for it will stay in town and be available to community groups and schools. 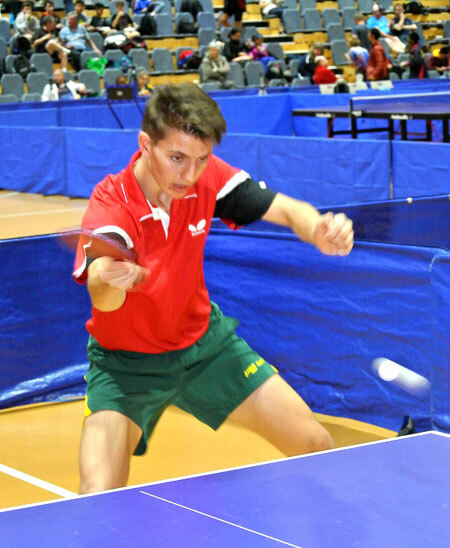 PICTURED is Alice Springs under-18 player Jacob Moore who has been earmarked for Table Tennis Australia’s development squad.